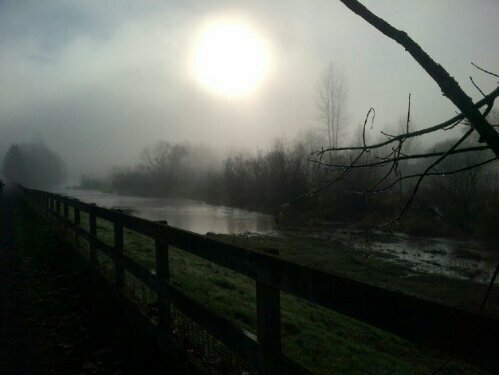 This entry was posted on Wednesday, January 15th, 2014 at 10:53 pm	and tagged with fiction, flash fiction, fog, Friday Fictioneers, sale, salesman, spirit and posted in Light. You can follow any responses to this entry through the RSS 2.0 feed. if a magical being says that what will we say? Fog for sale… some people can sell anything. Nice one. Or in this, they can *try* to sell anything. Keppler might need a bit more practice. I love your take on this prompt. You could have a lot of fun developing Keppler and Brittany further. They make quite a funny pair. They could be fun. We’ll see what happens, depending on the upcoming photos. It’s always fun to write slightly dim characters, which I think these two are. Delightfully strange, David. I enjoyed this a lot! I had no idea where you would go with this once I saw the title, but I love what you did with it! Nice. Interesting and modern. A water spirit having a hard time- well-penned. got a good chuckle from this. Creative as always. I must commend you for writing a story on your phone. I’ve read stories on the phone when we were on the road but I’d be in a mell of a hess if I tried posting from the phone. What a combination: a snake oil salesman and a water sprite. With a little ingenuity, I’ll bet they could come up with a more profitable product. Fun story. They could do a lot better but I’m not sure how intelligent either of them are. Well, that was an original take on the prompt. Class Action suit and dirty water and a spirit named Brittany. Hmmm. I don’t think I’d believe anyone who says a water spirit’s name is Brittany, even if it was. I think you have captured the essence of magic quite well… love the end… dealing in polluted fog..
🙂 Thanks. Glad you’re liking it. Is is sold per bushel, cubic yard? My wife is forever having yard sales. this sounds like another item she can throw into the mix. Maybe they bottle it and it comes out in a spray. Not sure, but it’s best to just fork over the money and don’t ask too many questions. I can see somebody buying it in a yard sale. “class-action suit” against water spirits? But of course, only a natural progression of things. Loved your take on the prompt. Nice! Clever story and great characters and dialogue.